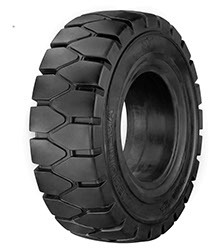 Constructed following the latest technologies and studied out for all those machines which require a high level of elasticity of the tyre and the maximum comfort for the operator. Special softer compound and enlarged tread surface guarantee better stability by optimizing the load dispersion on the ground. 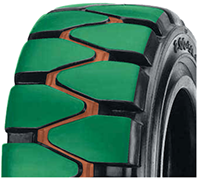 Built with a multi layered natural rubber compound process of three different mixes, the tyre assures maximum elasticity, comfort and life-time without, however, reducing the wear consumption and tyre life. The sidewalls have been strongly reinforced to protect the tyre from lateral damages. The particular bead profile prevents the intrusion of stones and other debris. Available also with non-marking and antistatic compounds for special applications and in easy-mount fast-click version to fit rims without locking.